Le Royaume de Hongrie Divisee en Haute et Basse Hongrie, Transilvanie, Esclavonie et Croatie. A beautiful example of Le Sieur Janvier's 1783 map of southeastern europe. Janvier's map covers much of modern Hungary, Romania, Transylvania, Moldova, Bosnia, Serbia, Croatia, Bulgaria, and parts of Austria, Poland, and Greece. Hungary at this time was under the role of Joseph II, a dynamic leader strongly influenced by the enlightenment. Joseph shook Hungary from its malaise when he inherited the throne from his mother, Maria Theresa. In the framework of Josephinism, Joseph sought to centralize control of the empire and to rule it by decree as an enlightened despot. He refused to take the Hungarian coronation oath to avoid being constrained by Hungary's constitution. In 1781-82 Joseph issued a Patent of Toleration, followed by an edict of Tolerance which granted Protestants and Orthodox Christians full civil rights and Jews freedom of worship. He decreed that German replace Latin as the empire's official language and granted the peasants the freedom to leave their holdings, to marry, and to place their children in trades. 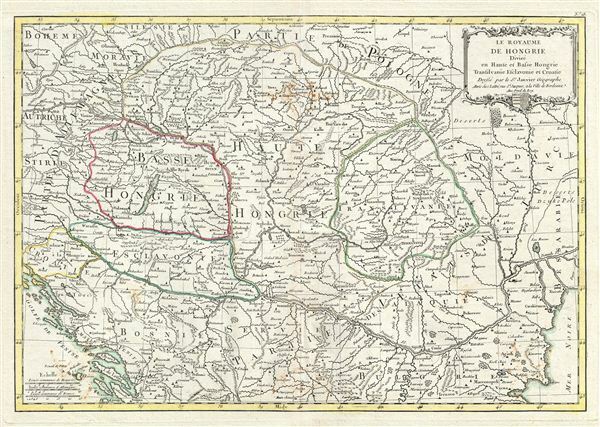 Hungary, Slavonia, Croatia, the Military Frontier and Transylvania became a single imperial territory under one administration, called the Kingdom of Hungary or 'Lands of the Crown of St. Stephen.' When the Hungarian nobles again refused to waive their exemption from taxation, Joseph banned imports of Hungarian manufactured goods into Austria and began a survey to prepare for imposition of a general land tax. Joseph's reforms outraged nobles and clergy of Hungary, and the peasants of country grew dissatisfied with taxes, conscription, and requisitions of supplies. Hungarians perceived Joseph's language reform as German cultural hegemony, and they reacted by insisting on the right to use their own tongue. As a result, Hungarian lesser nobles sparked a renaissance of the Hungarian language and culture, and a cult of national dance and costume flourished. The lesser nobles questioned the loyalty of the magnates, of whom less than half were ethnic Hungarians, and even those had become French- and German-speaking courtiers. The Hungarian national reawakening subsequently triggered national revivals among the Slovak, Romanian, Serbian, and Croatian minorities within Hungary and Transylvania, who felt threatened by both German and Hungarian cultural hegemony. These national revivals later blossomed into the nationalist movements of the 19th and 20h centuries that contributed to the empire's ultimate collapse. A decorative title cartouche bearing royal crest of Hungary appears in the upper right hand quadrant. A fine map of the region. Drawn by J. Janvier in 1783 for issue as plate no. 18 in Jean Lattre's 1783 issue of the Atlas Moderne. Very good condition. Original centerfold exhibits minor toning. Blank on verso. Some foxing. Rumsey 2612.037. Phillips (Atlases) 664. National Maritime Museum, 215.